1. Preheat the oven to 200°C, gas mark 6. Place the mushrooms, stalks removed, on a baking tray and season. Spoon the bulgur wheat mix on top. 2. Place the cod on the same tray and roast for 18-20 minutes or until the fish is cooked and mushrooms are tender. 3. 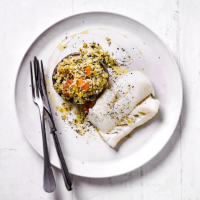 Divide the cod and mushrooms between 2 plates, drizzle the dressing over the mushrooms and serve.